Wear a grey short sleeve sweater with black leather sweatpants to be both casual and killer. When it comes to shoes, this ensemble is finished off wonderfully with white leather low top sneakers. If you're hunting for a casual yet absolutely chic outfit, marry a camel coat with white jeans. Both garments are totally comfy and will look fabulous together. Make white leather low top sneakers your footwear choice to make the ensemble current. If you're searching for a casual yet totally chic look, go for an orange blazer and orange skinny pants. Both garments are totally comfy and will look fabulous paired together. 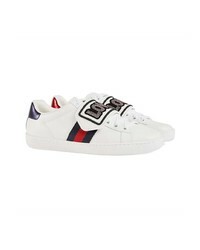 A good pair of Gucci ace sneaker with removable patches from farfetch.com are sure to leave the kind of impression you want to give. 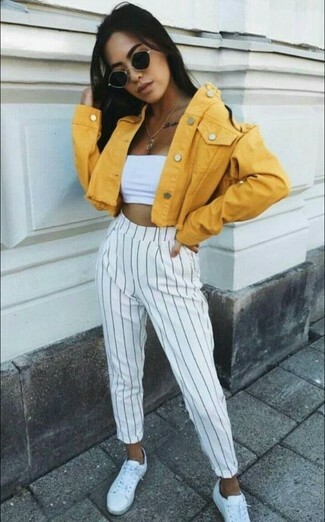 If you're searching for a casual yet totally chic outfit, consider pairing a yellow denim jacket with white and black vertical striped dress pants. Both items are totally comfy and will look fabulous paired together. Rock a pair of Gucci ace sneaker with removable patches for a more relaxed vibe. If you're hunting for a casual yet totally chic getup, marry a black leather biker jacket with a red leather pencil skirt. Both garments are totally comfy and will look fabulous together. 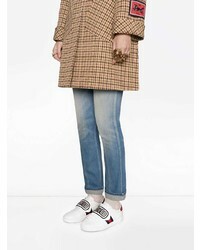 A pair of Gucci ace sneaker with removable patches from farfetch.com brings the dressed-down touch to the look. If you're hunting for a casual yet totally chic ensemble, marry a grey plaid coat with black leather leggings. Both garments are totally comfy and will look fabulous paired together. When it comes to shoes, this ensemble pairs wonderfully with Gucci ace sneaker with removable patches. Reach for a red floral casual dress to be both casual and knockout. Gucci ace sneaker with removable patches are a fitting choice here. 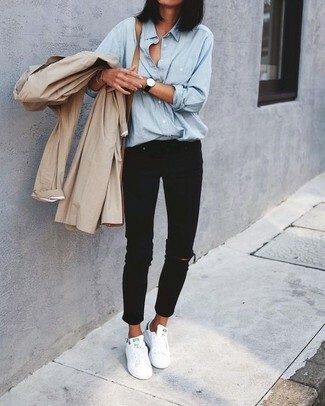 For an outfit that provides comfort and fashion, pair a beige trenchcoat with black ripped skinny jeans. 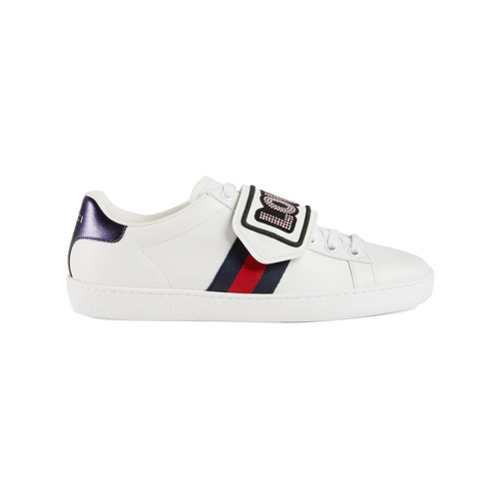 Make your look more fun by complementing it with Gucci ace sneaker with removable patches. If you feel more confident wearing something comfortable, you'll fall in love with this totally chic pairing of a camel coat and navy skinny jeans. For something more on the daring side to finish off this getup, grab a pair of white leather low top sneakers.